﻿ Why is Flo Not in the New Progressive Commercial? Progressive Insurance launched a new ad campaign this fall which did not feature their ever-present car insurance saleswoman “Flo”. What happened? Did Flo quit or get fired? Rumors abound on the internet, but we’ve managed to get some hard facts on what’s going on with the popular Flo from Progressive. When it comes to Progressive Insurance’s use of their spokeswoman, Flo, in commercials, they’ve been nothing short of prolific. In just the last six years the online insurance company has used Flo in their commercials 94 times. 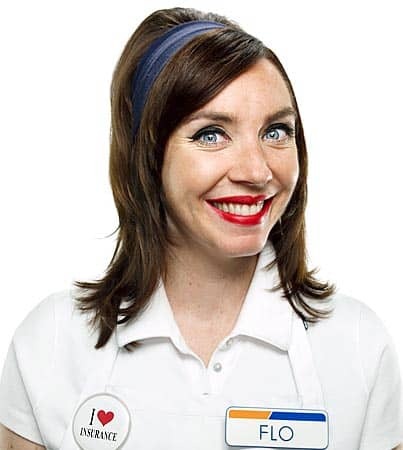 Despite an ongoing rumor (given weight by pundits from credible publications such as BusinessInsider.com) that Flo from Progressive was going to be “killed off” or, in other words, cease to be used as the company’s spokesperson, Stephanie Courtney has continued her role as Flo. Statements from the company have made it clear that they have no intent to remove the insurance marketing icon that rocketed them to the top of the insurance ladder. She’s a key branding element for the company, so it makes sense that Progressive wouldn’t just drop her like a hot rock. That said, the company is adjusting its strategy when it comes to how they make commercials and who they’re making their commercials for. According to a statement made by Progressive, which was reiterated on Adweek’s website, their goal now is to connect with Millenials by showing the humanity of their company. They want to show that the company behind Flo is made up of ordinary, hard-working, and honest people. The idea is that Millenials will engage more with a humanized brand with which they share something in common. In order to establish this position, Progressive introduced their newest commercial, titled “The Thread”. You can watch the spot below. This TV spot isn’t the only thing that Progressive is doing to reach Millenials. They’ve instituted an outreach and recognition campaign they’re calling “Apron Projects”. Progressive, instead of focusing in on their own employees or corporate efforts, will be featuring organizations and other companies who share their values on a special, dedicated website. The website will showcase the other group’s efforts while reinforcing that the values that drive them are values shared with Progressive. The company hopes that when viewing these ads and the accompanying website, their target audience will see a company of substance instead of a thirty-second bit of entertainment focused solely on selling a product. Progressive isn’t the only company taking a more holistic, personal approach to their marketing efforts. Both Allstate and Nationwide have launched their own “soft” ads that match the same model as Progressive’s “The Thread” campaign. One major difference lies in the fact that both Allstate and Nationwide employ celebrity voice-overs in their campaigns, while Progressive does not. In the new Progressive ad the voiceover is actually done by Sean McBride, the Senior VP and Creative Director of Arnold Worldwide—the agency responsible for inventing Flo the Progressive Girl. All Spokespersons have a finite lifetime. At some point a company will rebrand and, in the process, they often get rid of or alter their spokesperson or mascot. That said, Flo from Progressive has struck a very strong chord among a large group of consumers and she’s definitely a driving force for Progressive. It’s possible that the new ads will have a similar effect on Millenials. If it does, we can expect to see more of these types of ads in the future—but Progressive’s Flo will continue on until she loses her grip on her target demographic, which doesn’t appear to be any time soon. It should also be noted that the campaign, while not including Flo the Progressive Girl, it does reference her. Both the name of the campaign (“Apron Projects”) and the imagery of the ad directly tie in to the famous spokesperson. The element that ties them all together is the use of the apron, which has been a signature part of Flo’s look from the very beginning. Looking for compare.com Commercials? Check out what we’ve put together so far.